Packers CB Casey Hayward, who has yet to play this season due to a hamstring injury, was back on the practice field on Thursday in full pads for the second straight week. He was a limited participant. After returning to practice last Thursday, Hayward experienced soreness and was held out of practice for a full week, and Mike McCarthy was pleased with the progress he saw. This is the first week that Hayward hasn’t been ruled “out” for the game on the injury report. That doesn’t mean he’ll play this week, but it’s a sign he’s on track to return soon, barring any setbacks. In other injury news, DE Ryan Pickett was added to the injury report with a bruised hand, but he returned to practice after getting it looked at and said he’ll be fine. Pickett said nothing was broken. Rookie OLB Andy Mulumba (ankle) missed his second day of practice this week, but McCarthy is still holding out hope he can practice on Friday and be active for the game. Without Clay Matthews, the Packers only have three healthy OLBs at the moment in Nick Perry, Mike Neal and rookie Nate Palmer. RB James Starks (knee) is out this week, but McCarthy is encouraged by what he’s seen in Starks’ rehab. “I don’t think it’s going to be as long as some of the past injuries,” he said. Finally, T Derek Sherrod is getting ready to come off the PUP list. McCarthy didn’t confirm that he will come off the list next week, when he and the rest of the PUP players are first eligible, but he does expect Sherrod to be able to play this season. Sherrod, the Packers’ 2011 first-round draft pick, broke multiple bones in his lower leg in Week 15 of 2011 at Kansas City and missed all of last season, plus all of training camp this past summer. 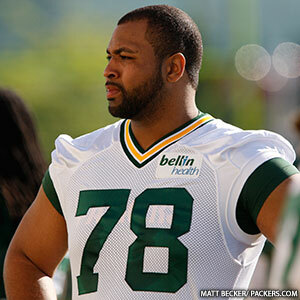 McCarthy felt that when the regular season started, he could see Sherrod getting closer to returning to the field. “I really felt at the end of training camp his workouts went to a different level,” McCarthy said. “He’s in excellent shape. He’s obviously a lot stronger than he was this time last year. As I’ve stated, it was a very, very serious injury. He needed the extra time. He looks good. He’s champing at the bit.